I’m still buzzing from the weekend – and what an absolutely amazing one it was. Saturday was a day of colour, and tutus, and dancing, and running, and music, and friends, and more colour, and silliness, and laughter, and basically too. much. fu. They call it the Happiest 5k and it really, really is. The atmosphere at Brighton Colour Run was electric, the whole place was buzzing, from start to finish. 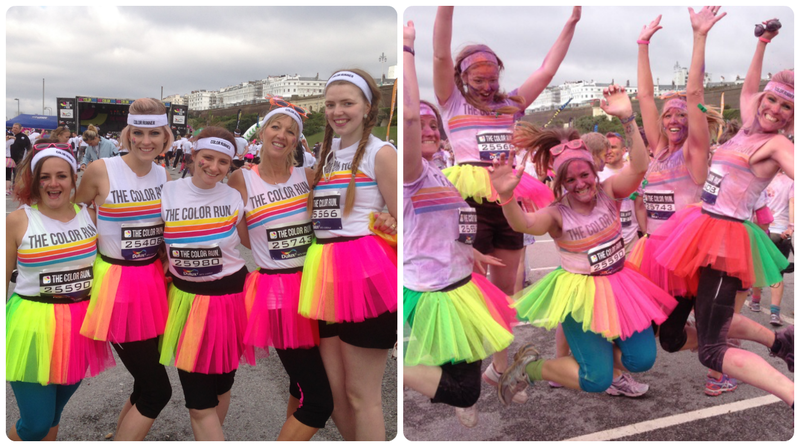 It didn’t stop when we got to the finish line either; there was some serious post-run colour raving to be done. There was a stage with music, and it was like one big after party. 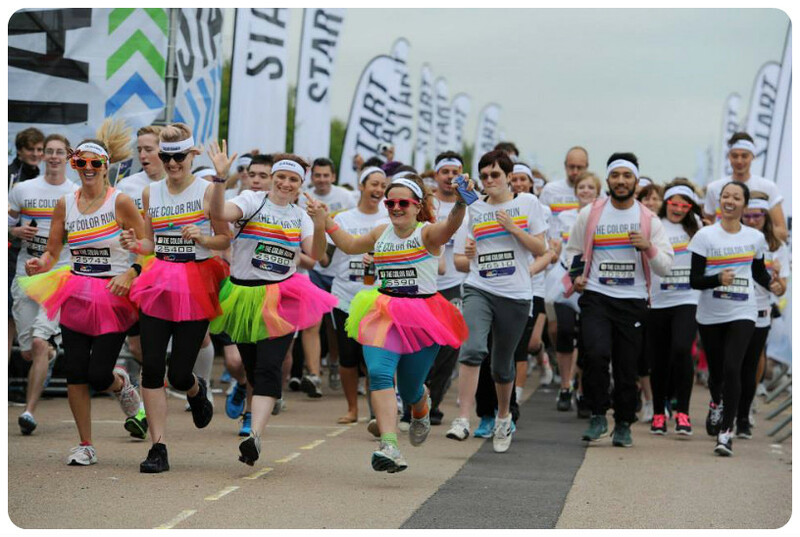 I don’t think you’ll find a race that’s more fun than the Colour Run (or is it Color Run?! ), we’re definitely doing it again next year, I can’t wait. With the fun and frolics of Saturday out of the way, it was time to get serious. 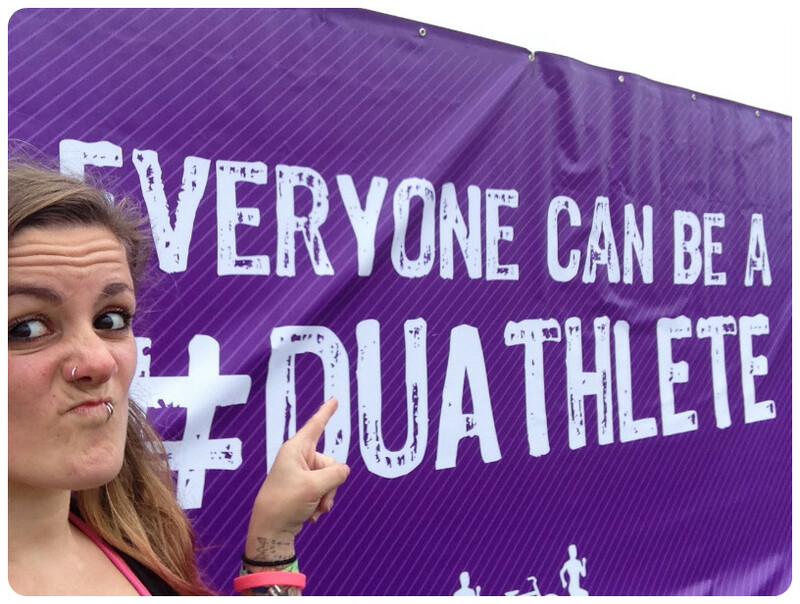 3,000 runners took part in the world’s largest duathlon on Sunday, and I was one of them. It was a day of nerves, and excitement, and about 200 pre-race wees (emphasis on *pre* race there boys, not *during*, geddit?) and running, and cycling, and running again, and rain, and malt loaf fuelling, and more rain, and cheering, and speedy transitioning, and a few expletives at some monumental inclines, with excited whooping on the epic descents that followed. At the end of it all, there was a medal, and smiles, and pride, and disbelief, and *ridiculous* amounts of endorphins, that I’m still basking in a little bit now. Oh, and a curry, and beer. There’s always room for a curry and beer. There were a few cramps too, but we’ll forget about those. 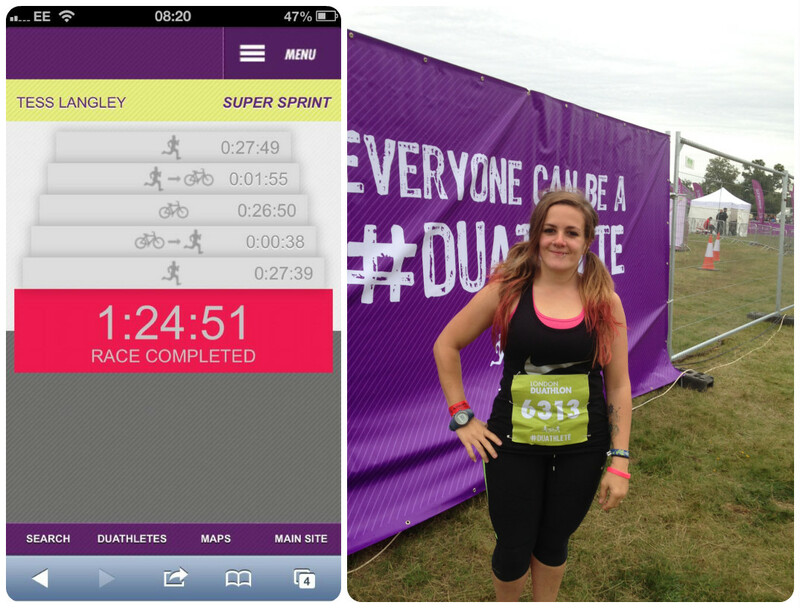 I don’t think I’ve ever been to the toilet so many times before a race as I did on Sunday. Once I got going though, it was fine, and just a case of getting on with it. I was in the second wave of the Super Sprint start, so got off pretty quickly. I felt really strong in the first 5k; my strategy after some good advice from my uncle was to not hit it too hard at the start, and make sure I had some energy left for the bike and second run leg. So, I ran at a comfortably hard(ish) pace, and stayed strong throughout most of the first leg. There was a bit of a hill to master, but it was a long and steady incline rather than a steep one so wasn’t too bad. With no music all I could hear was my own panting and others around me, which got louder as runners got closer to overtake. 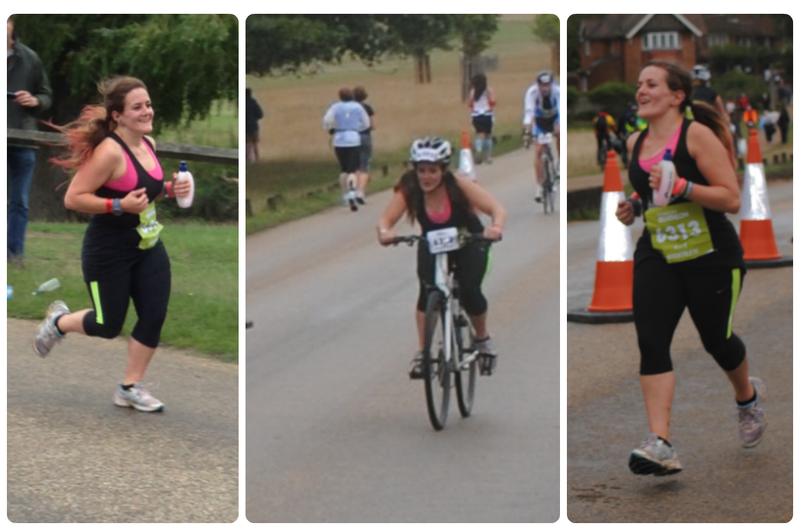 I did a fair bit of overtaking myself too, as I settled into my pace. I had a brief encounter with Beki (aka Miss Wheezy), which was short but sweet. (Well done by the way!) She was the only other blogger I managed to meet during the day, despite lots of excited tweets and ‘see you there’s’ beforehand with others. Sounds like we all made it out alive though, so well done everyone! My transition from run to bike was a swift one – I had no shoes or clothes changes to worry about, so only had to put my helmet on, grab my bike and go. I did some sort of run/slip/trip onto my bike and got into my pedal cages in an alright time and headed out for the 11k lap of the park. The bike lap was pretty hard, and seemed to go on forever, but not as hard as I thought it was gonna be. I cycle a lot around Brighton and do hills daily, so when I got to the killer steep hill that everyone had warned me about I sat back and got on with it. I’m not very good at standing up on hills, and it takes a lot of energy so I stuck with what I knew and got it done. It took me a good few minutes to get my breath back afterwards; on the way up it felt like I couldn’t get enough air in so I probably looked like I was having some sort of heart attack. One lap was quite enough for me, I can’t imagine how anyone doing the other laps would feel having to tackle it multiple times! On the way round I saw so many deer it was unreal, such beautiful creatures with antlers the size of small trees – it really was a magnificent sight to ride past in the rain, I wish I had a camera on me. On the way into the second transition I saw my cheerleaders again (third time already!) which gave me a real boost, and I prepared myself for jelly legs as I ran off the bike into the transition area to rack up and run out. Again, as I had no shoe changes to faff around with I was out really quickly, but it was suddenly really hard and uncomfortable to run. That last 5k was pretty horrific to be fair, I didn’t get comfortable until at least half way. The not-so-hilly-hill that I found so doable on the first run lap was suddenly a monumental task and I felt like I’d be quicker walking as I was going so slow. I was puffing and panting behind this girl and she kept looking round, probably wondering whether I was going to die or not, so I just apologised and tried to keep the noise down. Once we got over the brow of the hill it got better and I picked up the pace a bit. The 3km marker was a cue for me to pick it up even more as it was only about 10 minutes left until the finish line, and with the rain driving down on me I pounded on to try and finish strong. Reaching that finish line was pretty epic to say the least. Although the distances were definitely doable for me, it was whether I could put them together that was under question, and I don’t think I’ll be underestimating the Super Sprint distance again in a hurry I can tell you! It was my first race where I felt comfortable but knackered, if that makes sense, not like the Brighton Half where I was in pain for the last five miles, and dragged myself over the line. I really, really enjoyed it, it wasn’t a pain-ridden battle of survival. My overall time was 01:24:51 which I’m mega chuffed with, and I’m really happy with my splits too, especially as there were times where I thought I was going really slow. As far as events go, it was brilliantly organised, and the support was great (from my cheerleaders, other spectators, other participants and the Duathlon crew dotted around the more remote parts of the course). 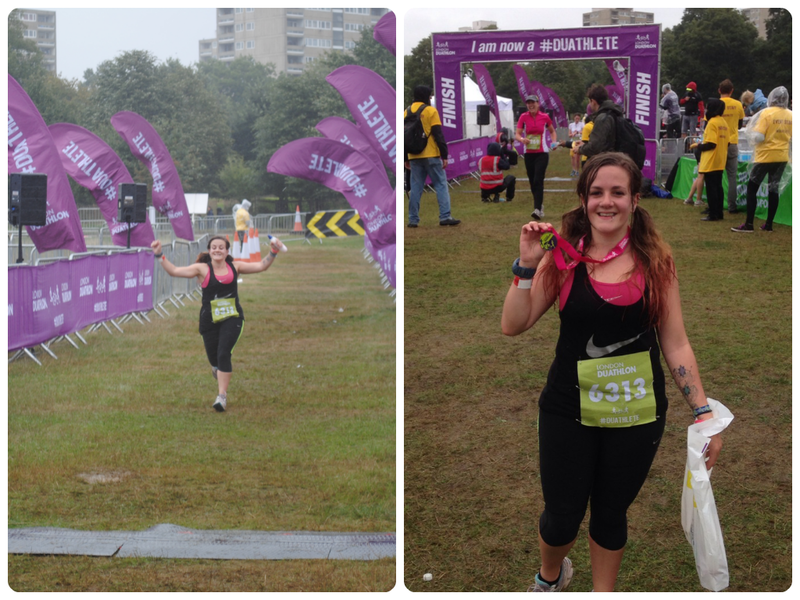 Massive thanks to my family and wonderful fiance for standing in the rain for an hour and a half to watch me become a duathlete. I’m deffo doing it again next year, along with a few others, so might go for the Sprint distance to see if I can master that too! 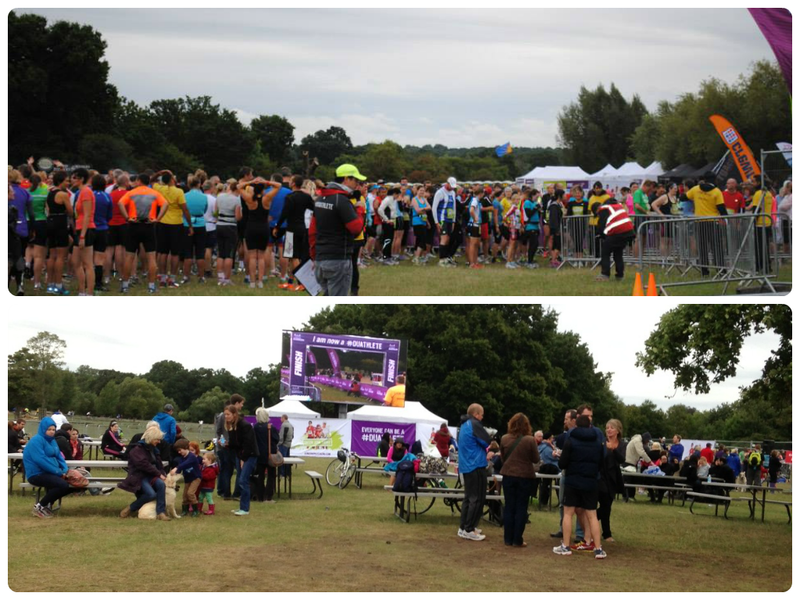 Did you do the London Duathlon this year? Did you enjoy it as much as me? Or will you be entering next year for the first time?